Do you have kids like mine? My 5 yo's seem to think the walls are their canvas. And of course all moms know this is not true! But it could be! 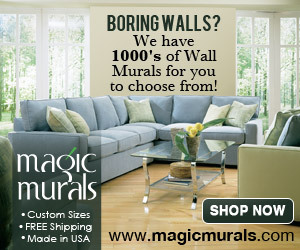 Magic Murals has Dry Erase Wallpaper Murals! How cool is that?? Perfect for the creative little people we seem to create! They come is a lot of different sizes and with different borders. They also have Murals for the walls that show Oceans, Villages and Skylines and more. As hubby is a New York Yankees fan, Im thinking the New York Skyline on the living room wall might be a good gift for him! Everyone in the Daigle Family loves New York, so I don't think the kids would mind! They have a customer Gallery where you can see the murals that other customers have put up. You should check that out before you buy so you can get a better feel for the one you choose.